A fantastical mushroom is suspended on a tree trunk while beneath it a giant acorn squats comfortably in the earth. It’s hard to tell which is art and which is nature. 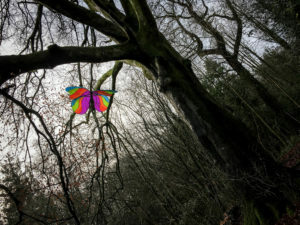 A little way up the path, a butterfly is definitely art; it flutters above us in technicolour beneath a kaleidoscopic sky. We are on the Alphabet Trail in Kendal’s Serpentine Woods, ticking off sculptures. (You can pick up your ABC of clues from the library or tourist information or download it here.) If you have small children leave an hour or two to do it, depending on their legs and grasp of the alphabet. A few dogs enthusiastically join in with the fun on our visit. Energetic family members can then stroll down to another of Kendal’s simple green spaces. Beast Banks is big enough for a family game or a picnic, and don’t forget to look out for a very British icon. 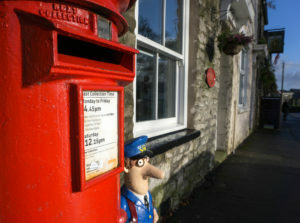 The former post office opposite the green was the inspiration for Mrs Goggins’ shop in Postman Pat and it’s worth a quick selfie with the post box or plaque. Pat’s there too. No Jess the cat though; maybe all those friendly local dogs keep her away. 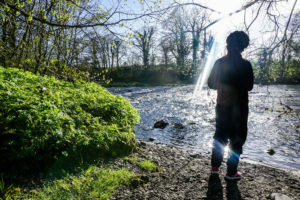 Kendal is the kind of town that’s made for wandering and although I have lived in the area since my kids were born, I still discover new things. Today I wander up a path near Beast Banks and find an obelisk. How did I miss that before? There’s no missing Kendal Castle. This atmospheric ruin is thought to date back to around the 12th century and is a great way to stretch your legs and get a bird’s eye view of the town. Or maybe that should be a ‘kite’s’ eye. If you go on a windy weekend you’ll likely find everything from ladybirds to teddy bears floating around. If you prefer to stay at ground level then Noble’s Rest (also known as Maude’s Meadow) is a tranquil little space, tucked away at the end of Maude Street, with plenty of trees and a wildflower meadow to hide and seek in. If you have teens go on to the Skate Park and then cool down with an ice cream at Riverside Kiosk at Gooseholme Park and watch the birds play on the water. Speaking of playing, the riverbank is a good place for an adventure. The gardens at Abbot Hall Art Gallery are enjoyable and the gallery is worth a visit. (Kids under 16 are free.) During school holidays you may stumble across an art workshop. Further on down the river there’s a good playground for the kids to let off steam. Challenge them to find the plaque at Waterside that shows historic flood levels and then pop in for a coffee at Waterside Café. Once you’ve exhausted the town’s central green spaces, head out towards Oxenholme Station to access The Helm. This simple yet stunning ridge top walk inspires you with views of the Lakeland fells, while Kendal sparkles below you. Spot the silver ribbon of the now familiar River Kent as it winds off towards Arnside. 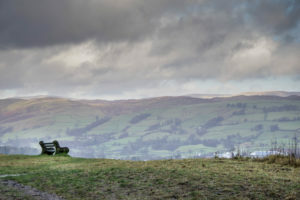 Or take a short invigorating walk up Scout Scar (you can take a pushchair if you choose the right path) where high and low fells unfold before your eyes. Art or nature? You decide.